One communication module plus one to 24 I/O modules can create a compact, flexible system with up to 384 channels that fits in a standard 19" rack! 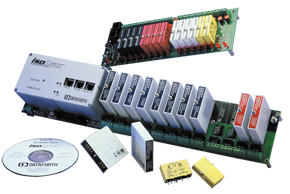 DIN rail mounted and ideal for rugged factory, process, and machine automation; military and aerospace, power and energy, oil and gas, and environmental monitoring applications. Out-of-the-box software enables users to easily create, save, and open graphical user interface projects for test, process, data collection, and data analysis applications. Data acquisition and control projects are created in just three steps in the Presentation panel using 18 tools and powerful MAQ®20 functions. Flexible and powerful, the SLX300 can be configured with up to 12 isolated analog input, 4 isolated analog output, and 8 isolated digital I/O channels; panel mount, DIN rail, or 1U enclosure are available. Provides the easiest and most efficient development tools to create, save and open graphical user interface projects. Projects can be distributed as runtime applications protected from user changes. 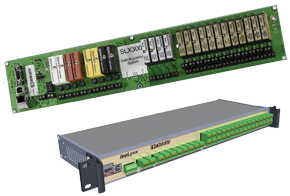 Fast, intelligent, and fully isolated, the SLX200 offers maximum flexibility of analog and digital I/O for a broad range of applications. Designed for rugged, industrial applications. Sensors that convert physical parameters to electrical signals. Signal conditioning circuitry to convert sensor signals into a form that can be converted to digital values. Analog-to-digital converters, which convert conditioned sensor signals to digital values. Data acquisition begins with the physical phenomenon or physical property to be measured. Examples of this include temperature, light intensity, gas pressure, fluid flow, and force. Regardless of the type of physical property to be measured, the physical state that is to be measured must first be transformed into a unified form that can be sampled by a data acquisition system. The task of performing such transformations falls on devices called sensors. A data acquisition system is a collection of software and hardware that lets you measure or control physical characteristics of something in the real world. A complete data acquisition system consists of DAQ hardware, sensors and actuators, signal conditioning hardware, and a computer running DAQ software. DAQ hardware is what usually interfaces between the signal and a PC. It could be in the form of modules that can be connected to the computer's ports (parallel, serial, USB, etc.) or cards connected to slots (S-100 bus, AppleBus, ISA, MCA, PCI, PCI-E, etc.) in the motherboard. Usually the space on the back of a PCI card is too small for all the connections needed, so an external breakout box is required. The cable between this box and the PC can be expensive due to the many wires, and the required shielding. DAQ device drivers are needed in order for the DAQ hardware to work with a PC. The device driver performs low-level register writes and reads on the hardware, while exposing a standard API for developing user applications in a variety of programming environments. 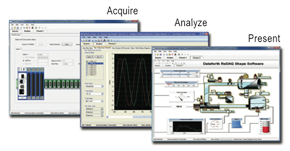 Data acquisition applications are controlled by software programs. Specialized DAQ software may be delivered with the DAQ hardware. This software can provide tools for building large-scale data acquisition systems. This article uses material from the Wikipedia article Data Acquisition, which is released under the Creative Commons Attribution-Share-Alike License 3.0.